Wow, I can hardly believe that next Monday is Memorial Day! I must admit that although I am amazed at how quiclkly time has flown by, I am psyched about the beginning of the summer season. Yes, I love all those summertime activities like cookouts, camping, hiking & biking, and the super fun family vacation! When I was a kid, I absolutely LOVED family vacations but I must admit that as a parent, I am always overwhelmed at the cost of a family vacation. That’s why I’m super excited to share with you that this summer, Atlantic Luggage is offering an amazing chance for YOU to win a family trip for 4! Isn’t that exciting? There are so many fun things for a family to do in both Los Angeles, CA and Washington, DC. Just think of the memories and if you win, you won’t have all the “vacation planning” and “can we actually afford this?” stress! To enter just click this link, win a family trip for 4, and complete the entry form. Could it be any easier than that? Traveling with kids can be stressful, especially in an airport. There’s the keeping track of the kids, the watching the clock to make sure you don’t miss your flight, and don’t forget the “joy” of transporting more than one piece of luggage at a time. Ugh! Well, I can’t help you with the kids or control time but Atlantic Luggage can help with your luggage needs. After looking around the Atlantic Luggage site, I’m so impressed that thier luggage is all so durable, lightweight AND affordable. It’s the perfect way to travel and would make an excellent graduation gift. The collection that caught my eye is the Compass Unite. This set of luggage has velcro straps so you can link two pieces of luggage together so you can easily maneuver two pieces of luggage through the airport with just one hand! Watch this video and I bet you’ll LOVE this collection too! 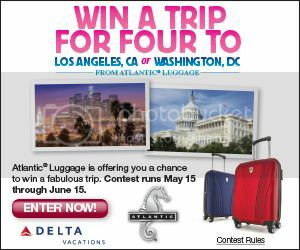 So, enter the Altantic Luggage Spring Sweepstakes for you chance to win a family trip for 4 and don’t wait! Your chance to enter is only opened until June 15!15!